Here’s 1 thing just about all small business owners have in common: the need to send invoices. Whether you sell handmade products or offer targeted client services, invoices are key to keeping your business afloat. Problem is, plenty of us don’t realise—or leverage—the true power of this all-important tool. These days, information-overload is ubiquitous. No wonder it’s easy to overlook or ignore a standard grey email or a dull printed page. A personalised, thoughtfully designed invoice stands out in a cluttered inbox or an ever-growing pile of papers. So how do you get your invoice to attract more attention? I’d love the opportunity to work together again in the future. Design matters. A well-laid out invoice is straightforward, easy to read and enjoyable to look at (no matter how big your bill). When it also showcases your logo and reinforces your brand presence, your invoice keeps your business top of mind—so you’re already a step ahead of the competition. Readability matters. When it comes to choosing fonts and colours, make sure yours are easy to read. Yellow is dandy for daffodils, and swirly scripts are sweet in a love letter—but keep them out your hard-working invoice. Mistakes matter. Typos, misspellings and other seemingly small mistakes indicate sloppiness, not professionalism. Check your invoice before you send it and catch those not-so-insignificant errors. Invoice on time, every time. When you bill consistently every week, month or otherwise, you subtly, yet effectively, remind your customers that you expect prompt regular payment. Avoid ambiguity. The way you organise your invoice should be as consistent as your billing schedule. If a client is confused about the total bill or when payment is due, you’re more likely to go unpaid. Set clear expectations. Late payments are a hassle at best. At worst, they can leave you in a financial bind. Best bet? Negotiate all terms, including fees for overdue payment, up front. Reward early payments. If your client is eager to pay ahead of schedule, consider offering a meaningful discount to incentivise this behaviour. (On a related note, your late-payment penalty should also be significant enough to inspire a change of behaviour). Simplify payment processing. Paypal, iZettle and Apple Pay are just three of countless money management platforms that streamline payment with just a click, tap or swipe. Automate (almost) everything. Every aspect of invoicing is easier, faster and more consistent when you have an automated system. You can get a lot of insight around billing patterns and practices and client behaviour, which means you can adjust your billing strategy easily. Invoices are a critical communication device that can help you get paid on time, every time. An effective invoice builds your brand, strengthens client relationships and keeps you at the top of the list whenever your customer needs help. So it literally pays to get your invoicing strategy right. QB Community members, when it comes to asking for (and receiving) payment, what’s your biggest frustration? Comment below and let's share our experiences! 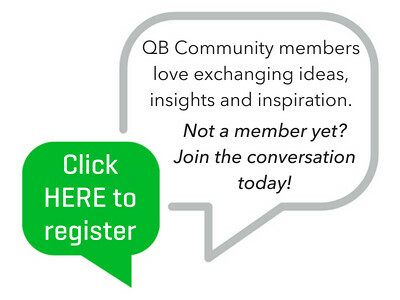 Want to join the conversation but not yet a QB Community member? Click HERE to sign up in a flash! I came across your profile and I saw that you're a reasonably tech-savvy qualified accountant. I thought this article might be useful for you and your clients! Let me know your thoughts in the comments below ! Welcome to the UK QB Community! I would love to know more about what you do; are you an accountant? Are you self-employed or do you own a business? On the topic of invoices, what are your top tips for making your invoices stand out?